How to get suitable page size in editor for 3D eBook? Q:How to get suitable page size in editor for 3D eBook? Not all people have screen with the same size. Absolutely, when you enter the page editor in the 3D PageFlip Professional, we will find the page shown in the editor interface is too width or too height. This is not convenient for us to edit the page or insert multimedia elements in the 3D page turning book. There is a little tool hide in the editor to help people edit pages. Here will give you a detailed introduction. 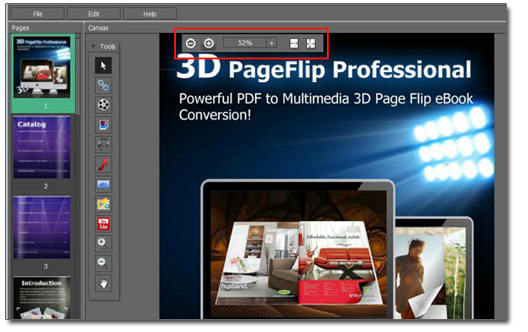 You can use it easily to control size of the 3D page flip book page. Step1: Run 3D PageFlip Professional and enter page editor by clicking Page Editor Button in the tool bar. Step2: Move your mouse to the top of the page, the tool bar will occur. You can click zoom in and zoom out button to adjust size of the 3D eBook page. You can click Fit Width or Fit Height to have a quick adjustment for the size. Step3: Start editing after you gain a suitable page size.